With Emotional Freedom Technique (EFT) or tapping as it is commonly referred to, you tap on specific points (see diagram below) while focussing on the emotion and thinking about the issue you want resolved. The points that are tapped on are acupuncture meridian points, which have been used in Traditional Chinese Medicine for thousands of years. So, tapping is a combination of eastern medicine and western psychology. Think about it. When you experience a negative emotion, such as stress, anxiety or a negative belief, you tense up. In EFT, we say that you have a block in your energy system. When you tap on a specific set of points around the body, you tap on all of the major meridians in the body, and send a vibration down the energy line which causes the block to loosen a little. You keep on tapping until the block is completely removed and now when you think of what was previously causing you stress, you feel calm, relaxed and at ease. While tapping on the selected points, we also say words that are related to whatever is bothering you so it is both a physical and a talking therapy. EFT Tapping comes under the banner of energy psychology which is a good description as it deals with the energy system, and our thoughts, beliefs and feelings. EFT can be used on anything including general stress, pain relief and anxiety. For me, the real beauty of EFT tapping is when we change long held, beliefs, behaviours and overcoming past traumas. Understand more about the philosophy and history of EFT and meridian therapies. Tailored EFT Therapy & packages to help you understand and break through emotional blocks. Learn how to use EFT to benefit you & your family or to become an EFT practitioner. Sometimes when people come to see me, they have so much going on in their lives, they are completely overwhelmed and don’t know where to start. Or maybe they have a lot to be thankful for, but they have this deep sense of unease, they can’t connect to joy and are feeling hopeless, lost and with no direction. My job is to help you to sort through everything and to ask the right questions so we can discover what is really going on for you. Once we have established what the root of the issue is, then we can work at releasing the negative feelings, emotions beliefs and behaviours. 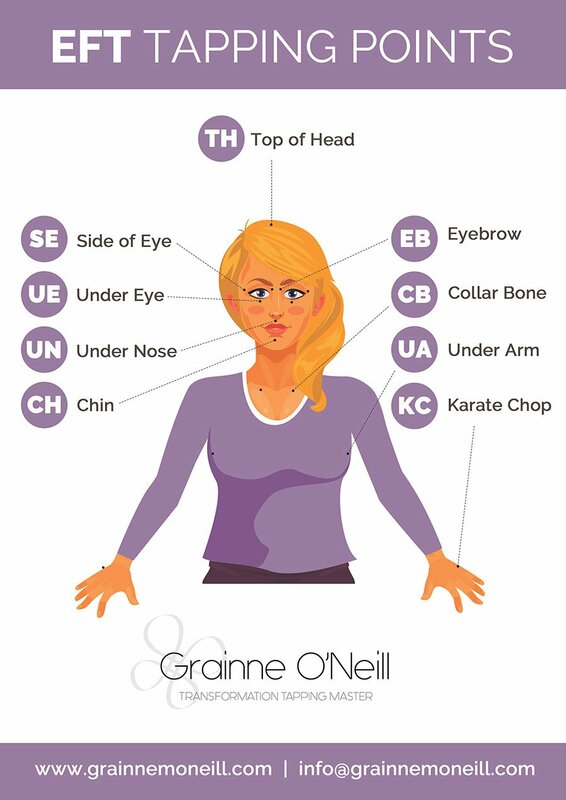 We do this by using a talking and tapping therapy, where we tap on acupressure points around the face and body. One of the key things with this therapy is that is measurable. Before each round of tapping, you rate the negative emotion you are feeling from 0 to 10, and then after each round, you rate the emotion again to see if this has changed. At the end of the session, I may also give you some tapping homework to do, or we may set some tasks to be achieved by the next appointment. I see people every 2 weeks, usually in blocks of 3, 6 or 9 sessions. Leaving a gap of 2 weeks, gives you time to process what has happened in the session, while at the same time, keeping the momentum going. My aim in working with people is to help people to release any negative emotions and beliefs that are holding them back and to get back to the core of who they really are, so that they can move forward with confidence and joy.